The head of recently merged beauty and healthcare group Alliance Boots is to step down. Chief executive Richard Baker resigned from the firm as it announced a major management shake-up. It comes after private equity firm KKR and Boots deputy chairman Stefano Pessina bought the firm for £11.1bn. As Mr Pessina is being lined up to take on a new role as chief executive of the newly-private firm, no replacement for Mr Baker is expected to be named. "We are grateful to Richard Baker for all he has done in leading the Alliance Boots group through its merger and for all his hard work and excellent results," said Mr Pessina. "We are confident that he will go on to new levels of achievement in a role commensurate with his undoubted skill and ability." Mr Baker joined Boots four years ago from supermarket giant Asda. According to reports, on top of making an estimated £6.5m through the sale of the retailer, he is expected to leave the group with a bumper pay package. Scott Wheway, managing director of Boots the Chemists, will also be leaving the group. He will be replaced by the unit's current healthcare director, Alex Gourlay. 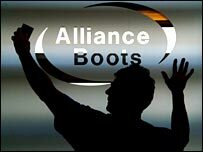 Alliance Boots was formed less than a year ago after the merger of Boots and drug wholesale giant Alliance UniChem.